This nearly life-size statue wears remarkable clothing, made almost entirely of sheets of silver. The diverse range of materials used in its manufacture—including wood, glass and paint—is also of note. 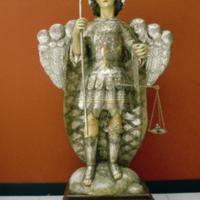 This statue representing St. Michael was made in Guatemala. 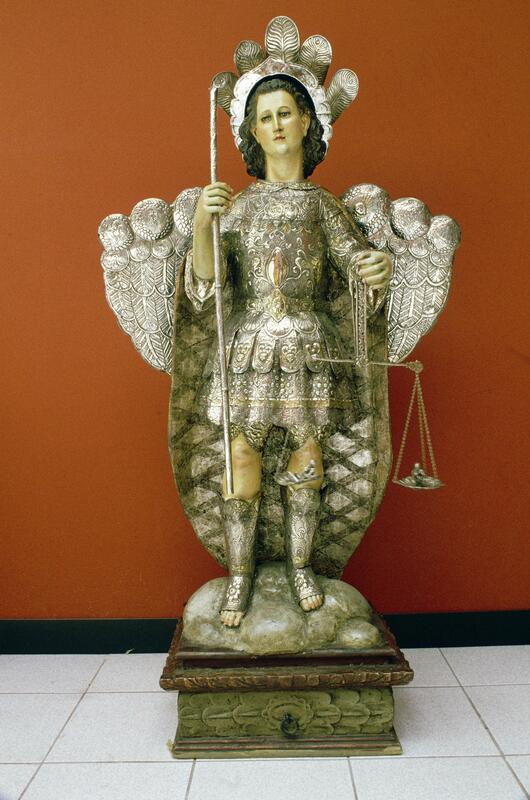 The statue represents the archangel Michael, a popular saint for leading the battle against the Devil. The saint’s elaborately worked tunic is modeled on military costume worn by Romans at the time of Christ. As judge of souls, Michael is often shown holding a balance containing, as it does here, small and naked humans representing the soul. The names of none of the artisans who worked on this piece are known today. Large scale works like this one were most likely destined to decorate churches. To make this statue, a range of professionals would have been called upon: a sculptor to work the wood, a gilder to create its decoration, and a silversmith to create the clothing of plated silver. While guild ordinances suggest that each of these roles was to be played by a distinct person, each a member of a distinct guild, in actual practice in Guatemala, single individuals may have possessed skills that cut across guilds. Since statues were regularly “updated” with new paint or clothing, this statue’s silver garb may have been added in a renovation campaign. Little is known about the history of this piece, but one expert thinks that pieces like these may have been crafted in Quetzaltenango, a city some 130 kilometers to the west of Antigua Guatemala. While originally intended, like much life-sized sculpture, to be placed in a church retable (retablo), it may have been moved many times within the church during its life. It is now found in a university museum in Guatemala City. Artisans in Spanish America often experimented with combinations of materials and techniques. This work brings together carving, estofado, and silverwork. While silver was often used to decorate saints’ statues—usually in the form of wings or halos, its use here as full-body armor was a tradition developed in Guatemala. Alonso de Rodríguez, Josefina. 1981. El arte de la platería en la Capitanía General de Guatemala. 2 vols. Guatemala: Universidad de San Carlos de Guatemala. Esteras Martín, Cristina. 2002. “San Miguel Arcangel.” In El país del Quetzal: Guatemala maya e hispana. Madrid: Sociedad Estatal para la Acción Cultural Exterior. García Saiz, María Concepción. 2002. “La escultura en Guatemala.” In El país del Quetzal: Guatemala maya e hispana. Pp. 139-151. Madrid: Sociedad Estatal para la Acción Cultural Exterior.